Editors: Roehlkepartain, Eugene C., King, Pamela Ebstyne and Wagener, Linda, et.al. 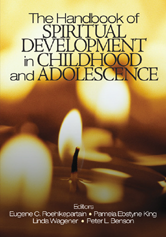 The Handbook of Spiritual Development in Childhood and Adolescence breaks new ground by articulating the state of knowledge in the area of childhood and adolescent spiritual development. Featuring a rich array of theory and research from an international assortment of leading social scientists in multiple disciplines, this book represents work from diverse traditions and approaches. 32. Bridging to Public Policy and Civil Society - Steve Hornberger, Roberta Furtick Jones, and Robert L. Miller Jr.